Come out an meet artist Donna Elias in person this winter while the artist is on her 2016 tour of Florida! 20th Annual Naples New Year’s Art Fair. One of the TOP Fine Art Shows in America! 5th Avenue South in downtown Naples, Florida. 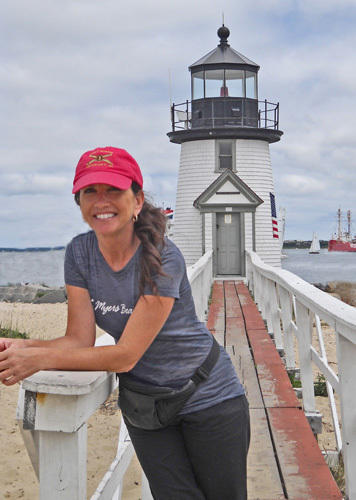 Great American Lighthouses artist Donna Elias at Nantucket's Brant Point Light, August 2011. For more information on the Great American Lighthouses Collection or artist Donna Elias, please visit www.donnaelias.com - email Donna Elias at artistdonnaelias@aol.com or write: Donna Elias, c/o Donna Elias Studios, LLC PO Pox 901, Brigantine, NJ 08203. 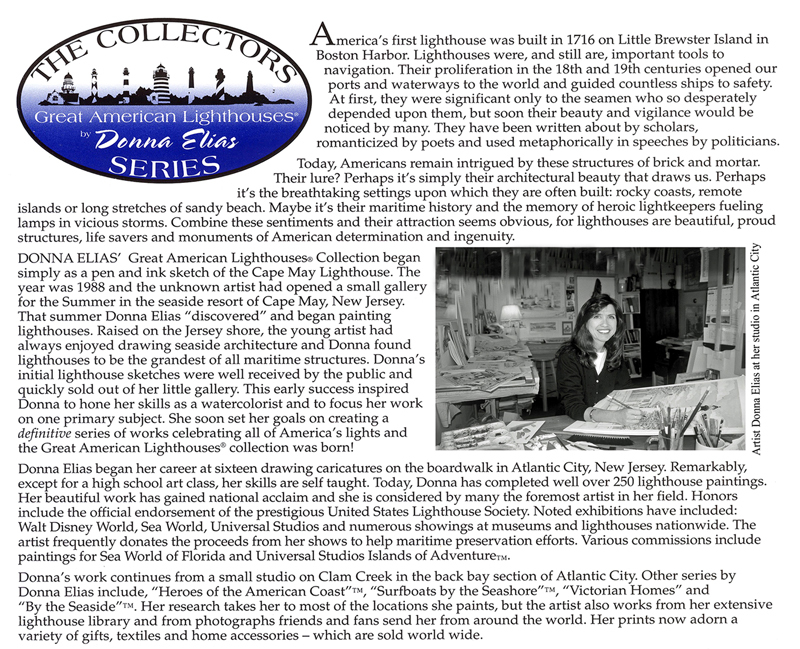 Donna Elias' Great American Lighthouses Collection ®. Lighthouse Art, Lighthouse Gifts, Lighthouse Wall Decor, Lighthouse Pictures, Lighthouse Jig Saw Puzzles, Lighthouse Coffee Mugs and much, much more! The artwork and designs of Donna Elias are protected under US and International Copyright Laws. No image, design or artwork by Donna Elias may be reproduced in any form whatsoever without the express written permission of the artist or under license of the artist and or Donna Elias Studios, LLC. Copyrights 1988 through 2015. All Rights Reserved. For more information, please contact Donna Elias Studios, LLC PO Box 901, Brigantine, NJ 08203 / 609-266-5826.